In 2009, Heat Factory USA sponsored two world renounced mountaineers on their climb of Earth’s highest mountain. Mount Everest is located in the Himalayas and attracts many highly experienced mountaineers as well as capable climbers willing to take on the climb. Its peak is 29,029 ft and although it isn’t the furthest summit from the center of the Earth, Mount Everest continues to be one of the most challenging mountains to climb. Heat Factory USA provided Hand Warmers and Large Adhesive Warmers to Manuel A. Pizarro and Andrew S. Rossin-Arthiat during their long climb. The two of them left Montreal on March 1st, 2009, after a year of preparation. The both of them climbed as a fundraiser to serve the Canadian Lung Association. Pizarro was born in Valparaiso, Chile in 1972 and later immigrated to Quebec with his parents at the age of eight. He became a pilot at the age of sixteen. Piloting and mountaineering weren’t the only sports Manuel Pizarro was involved in- he was also a instructor pilot, parachutist, motorcyclist, survival instructor, and diver. It wasn’t until 1997 that he discovered that climbing expeditions were the times he has felt the freest and the most accomplished. So for over a decade, he led expeditions to the highest peaks in the world. In 1995 he climbed Mount Aconcagua in Argentina and in 2000 reached the summit of Mount McKinley in Alaska. In 2002 Pizarro climbed the famous African mountain, Mt. Kilimanjaro, and finally in 2007 he climbed Mount Everest. 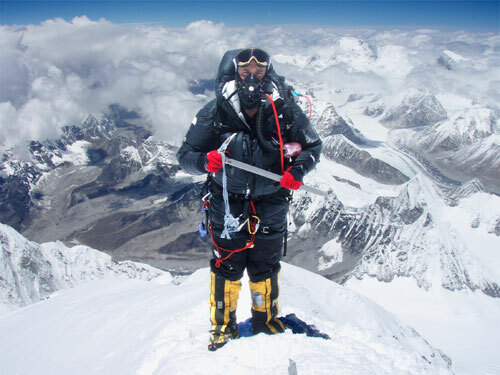 He was joined by Andrew S. Rossin-Arthiat for his second Everest climb. Andrew, or Andre wrote about the medical aspect of the climb while the two of them filmed a documentary and worked on two books. Manuel Pizarro included works discussing the philosophical and spiritual aspects of life and of course, climbing. Heat Factory USA was a proud sponsor of these two athletes for their Mount Everest climb. This entry was posted in Mountaneering and tagged camping, climbing, hiking, manuel pizarro, mount everest climb, mountaineering, mt everest. Bookmark the permalink. ← How Do Handwarmers Actually Work?